It has been 77 days since the catastrophic oil spill took place in the Gulf of Mexico—but things are far from over, despite shrinking column inches. 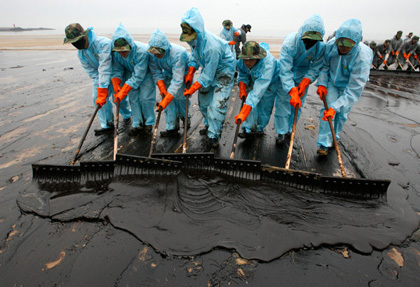 While millions have engaged in the effort to restore the area from the spill's intense damage, the oil continues to spread, extending now to the coastlines of New Orleans. And, while you want to help, sometimes just cutting a check can be financially daunting and uncertain—you don't always know where exactly your money is going. That's why we've put together some local and worthwhile ways to lend a helping hand. Many New Yorkers have turned to donating hair to help the oil spill through the charity Matter of Trust: They've been collecting dog and human hair for the past several months to make booms which absorb the oil (donated hair is shaped into dreadlock-type mats and placed in the water to soak up oil). Though their warehouses are stocked right now, they're about to schedule the first deployment to the affected region, meaning in the next month or so they'll be ready for more of that follicle stuff. And even if you can't part with your lovely locks, you can raid your pantries and closets for burlap sacks, canvas bags, and pantyhose, all of which are used to make the booms. Even though the headlines are thinning out, it's never too late to start helping out.